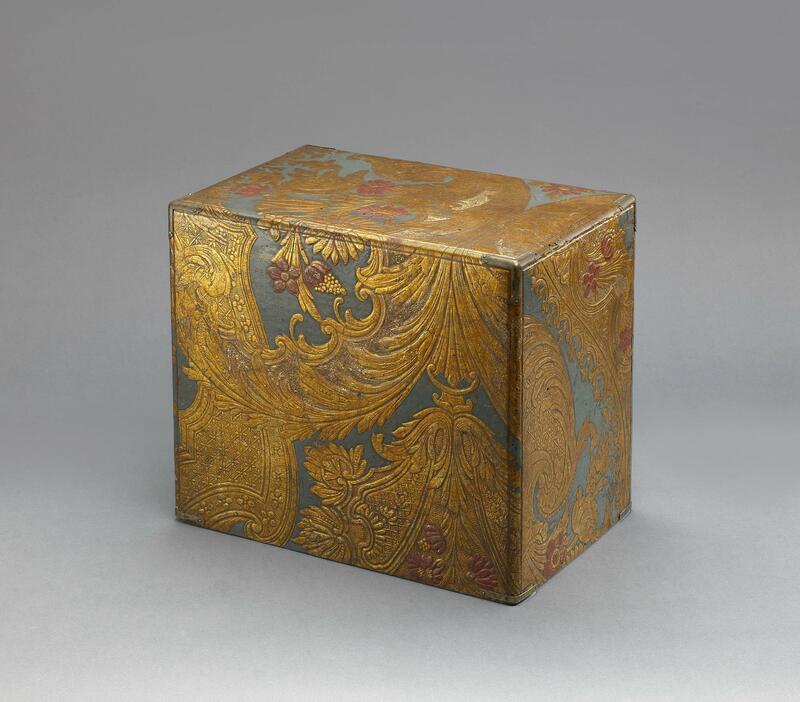 During the Edo period, quite some gilt leather from the Low Countries, sailed to Japan. 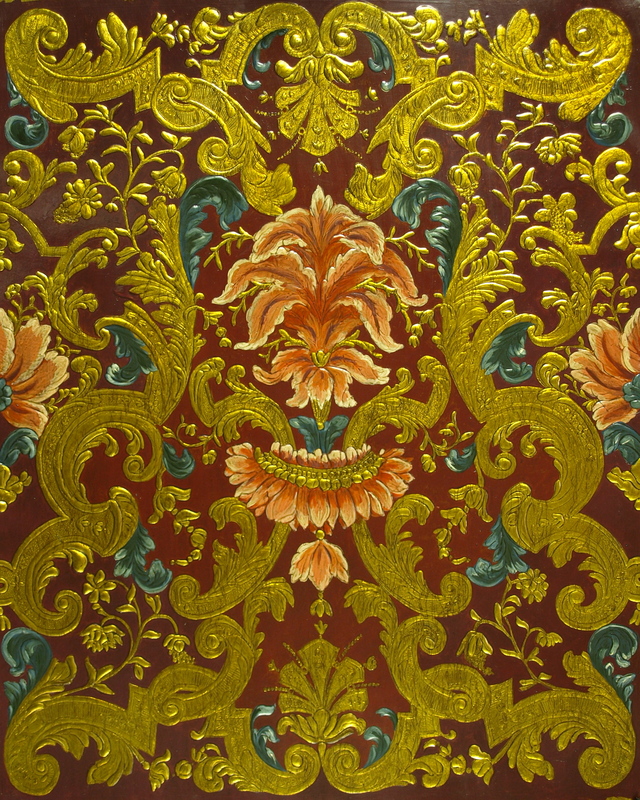 Original gilt leather rooms can be seen all over Europe and in some places of the US as well. 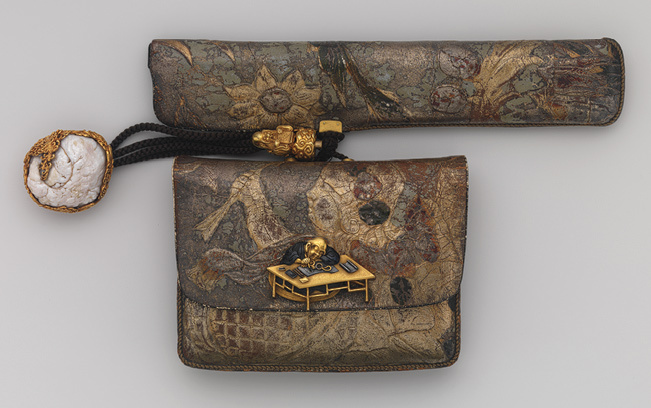 Instead the Japanese made precious objects and exotic accessories from the Flemish or Dutch leathers. 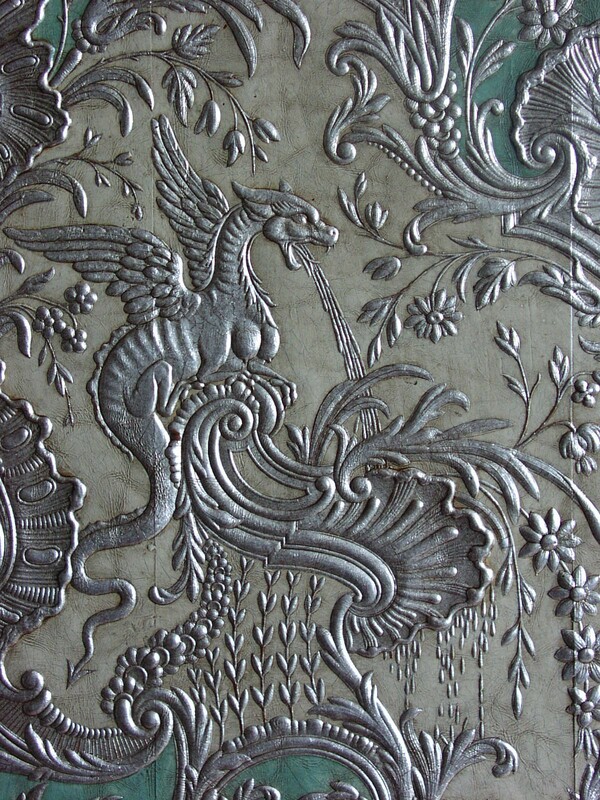 Bespoke Gilt Leather you said ? 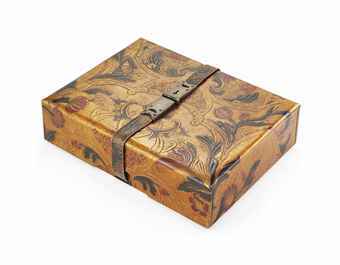 At Lutson you will not find Gilt Leather ready form the shelve. At all times we have claimed to fight uniformity. which makes each panel unique in its own ways. 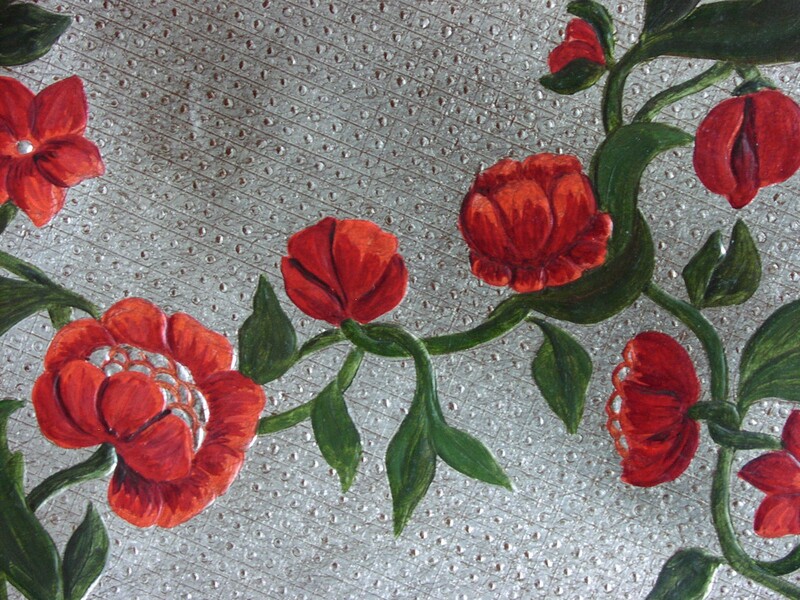 Bespoke or Custom made Gilt Leather is our thing. 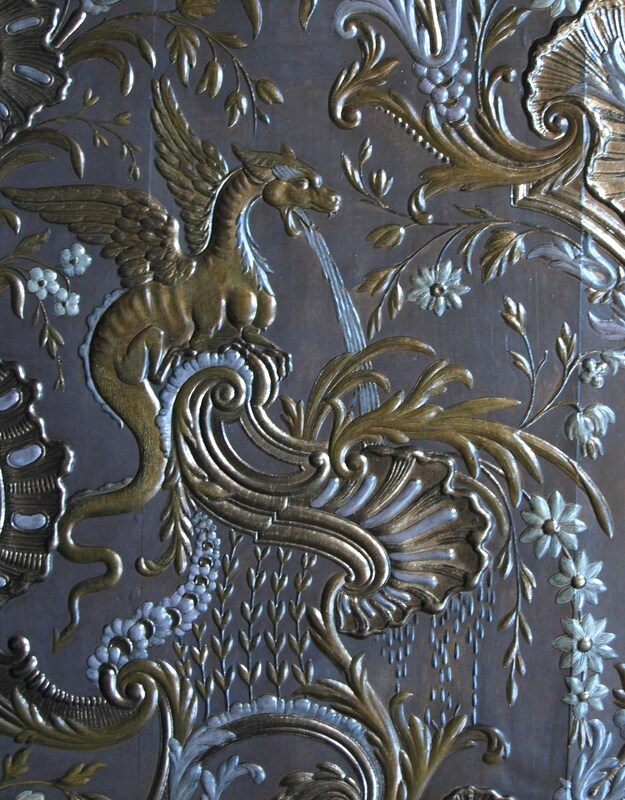 Fact is that if you wish bespoke Gilt Leather ….. Here some pictures of a very bespoke Mandarin. 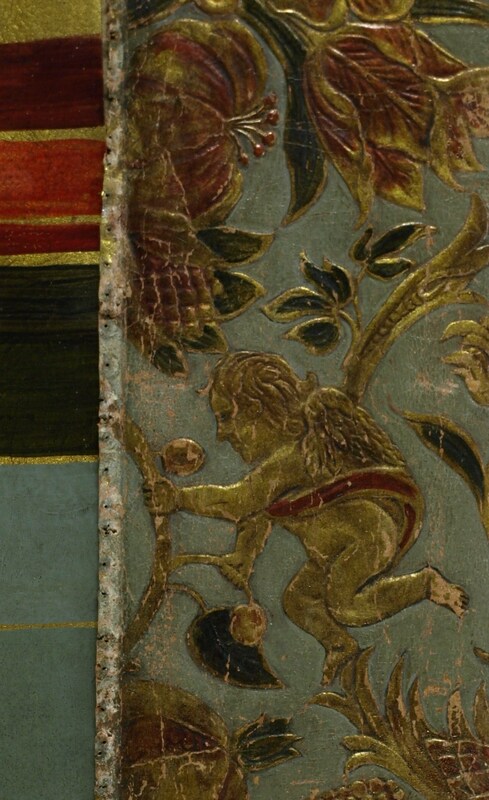 This panel is not a “traditional” polychrome panel. 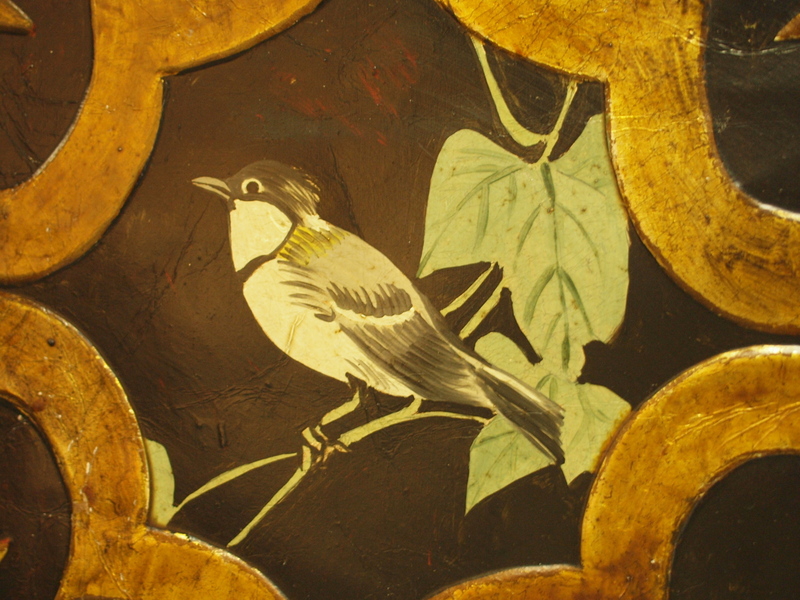 The inspiration came from the early 18th century Coromandel lack screens. 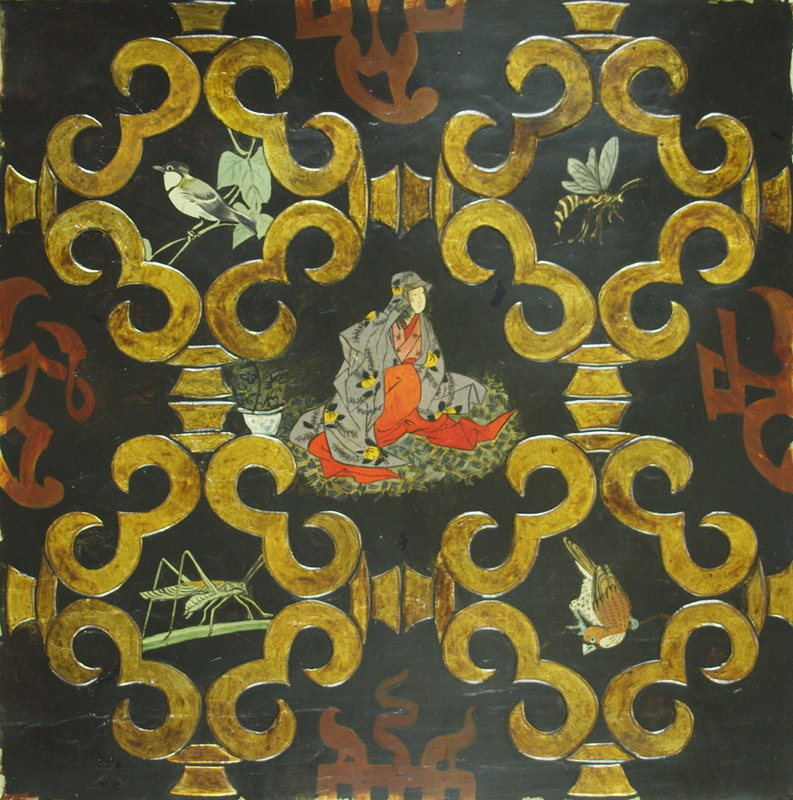 In the the Lower Countries and in the UK some Chinoiserie screens were made on tooled Gilt Leather. 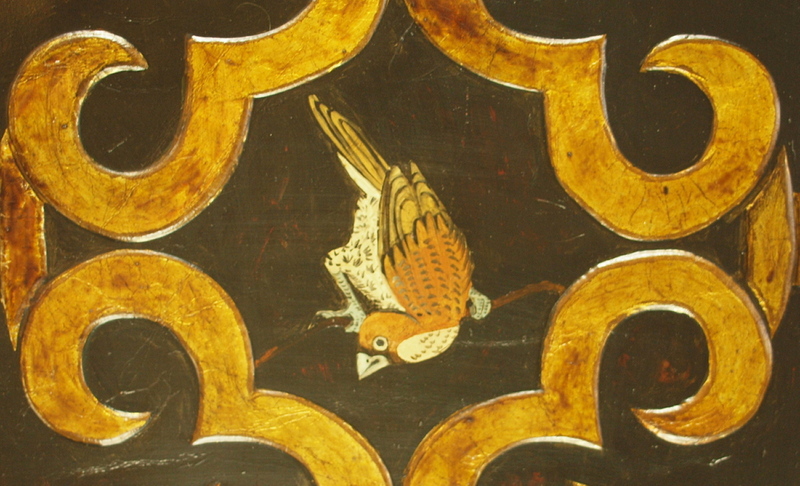 the semi transparent black background was painted on a reddish ground. It was produced by a German workshop form Augsburg. 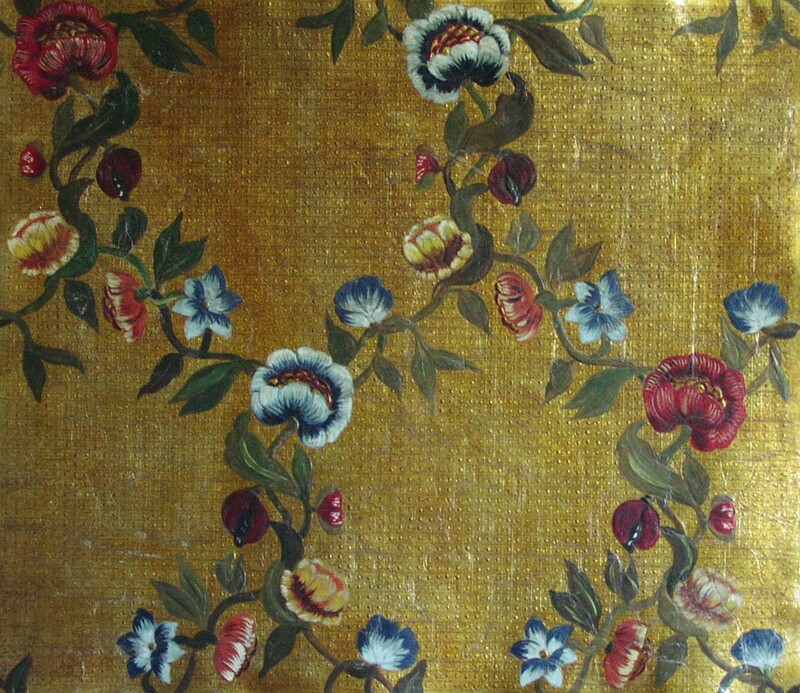 The Plaisance is probably a Flemish design from circa 1750. 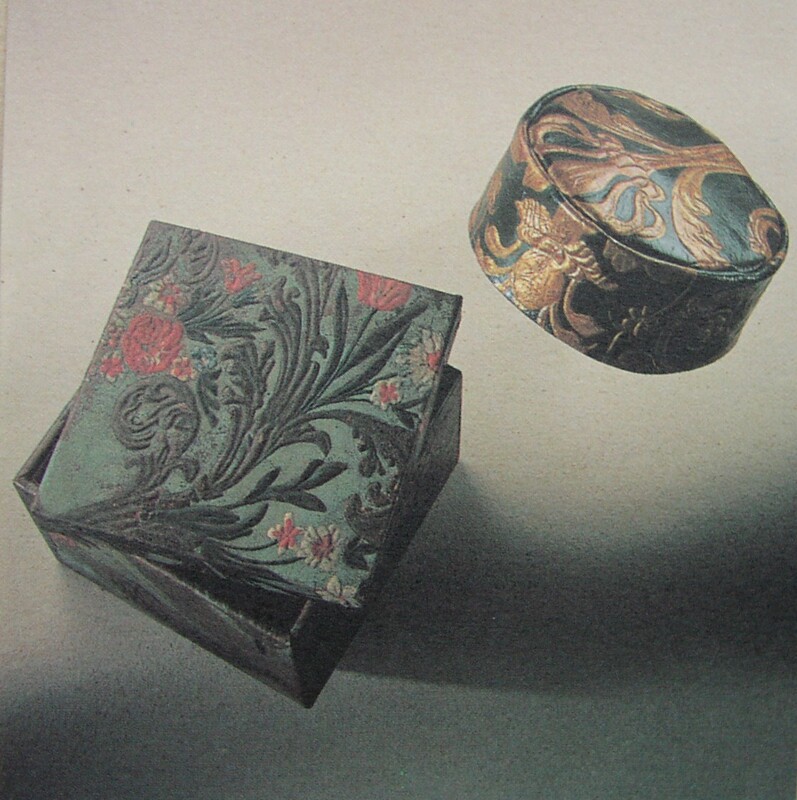 The picture bellow shows the original as it can be seen in the Plantin Moretus Museum Antwerp. No other archive seems to be available, perhaps some panels are stored in the reserves of decorative arts museums, who will tell. 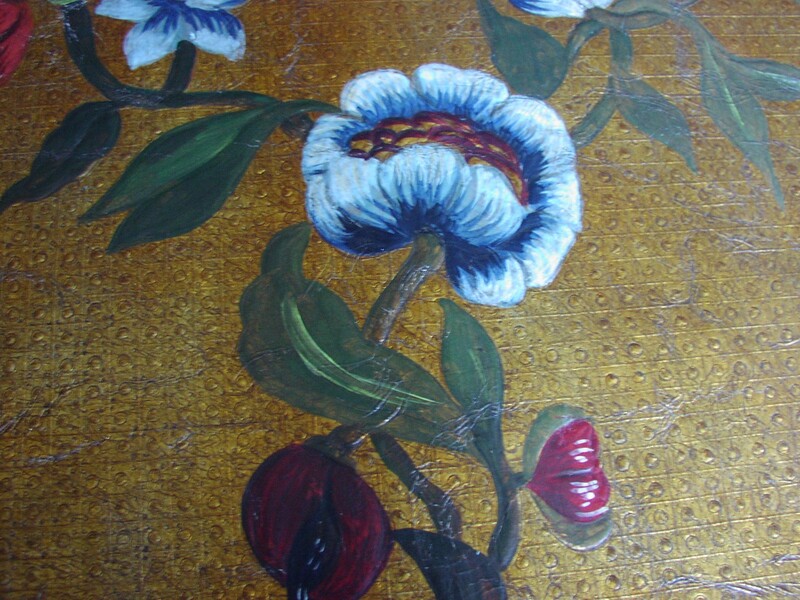 The original design is small scaled and busy with perhaps more than 70 flowers per panel. We decided to rescale the design and reduced the amount of flowers to 28. This way we could contain the work and thus the price per panel it also makes the design more appealing for contemporary designers. 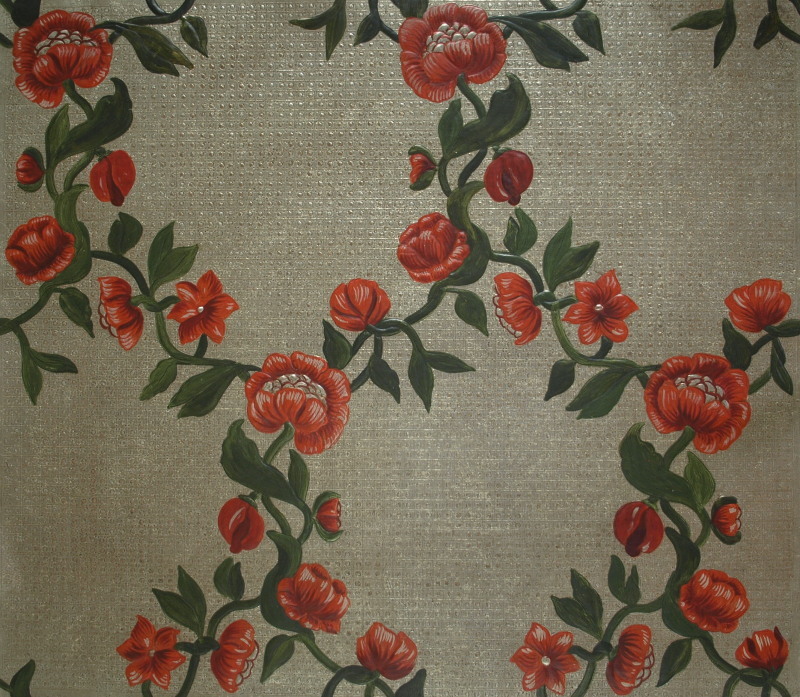 This panel is one of a set made for a customer in Amman Jordan. 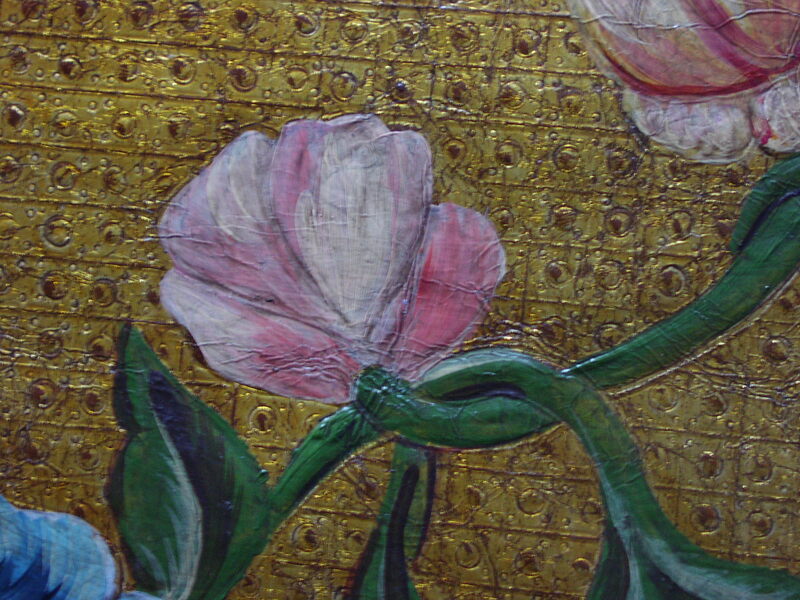 Traditionally the color scheme for this panel would be a gilded ground, greenish leafing and polychrome flowers. This could well be a close match to a 18th century panel. To end with, here what a set of 4 looks like, well I hope the upholseter will do a better job than I am on my pc. The aim was to make a square of 4 panels, hmmm it didn’t work out as I expected. The job and the challenge were considerable. 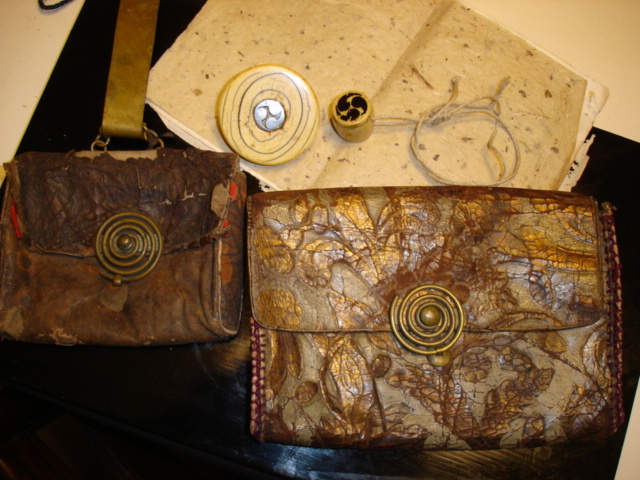 We made samples for over 8 months, meanwhile the people in charge of the project tried to source other suppliers for the gilded leather in order to secure their need. 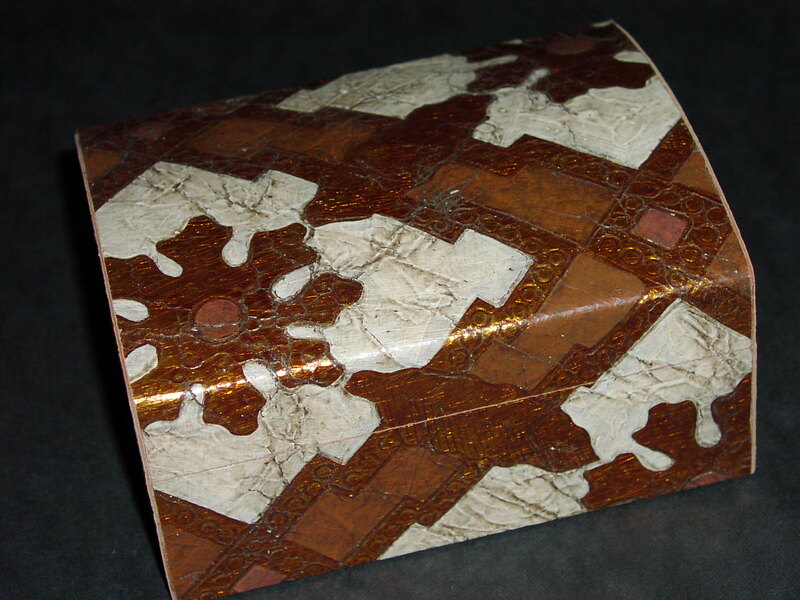 In the end we got the order for over 400 panels of gilded leather. For many years I have been trying to get some pictures of the job which I never physically saw. For an unknown reason MetLife has not been very diligent with pictures. Despite several requests we never got one picture. Perhaps the posting from Robert Kelly and this one might help moving lines and will we finally get some good pictures from our distinguished customer. 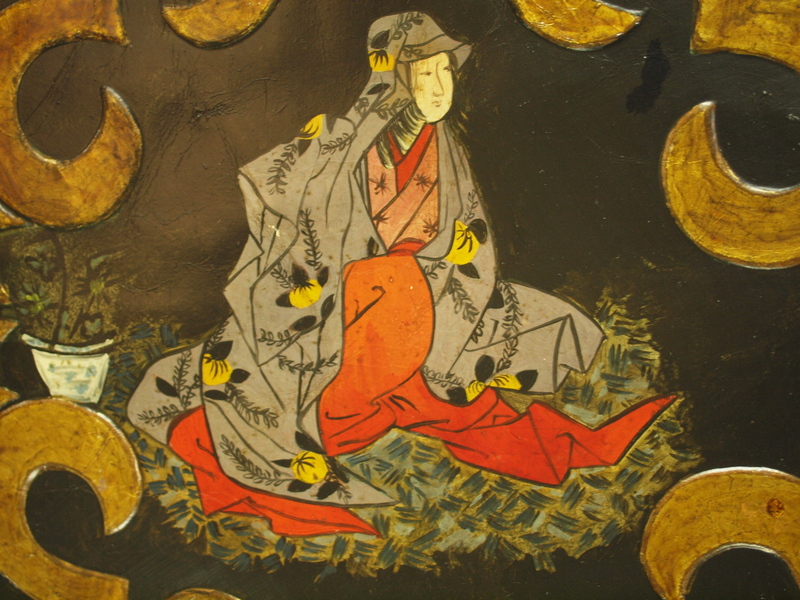 This is an original panel which we were to reproduce. unfortunately one can’t judge the poor condition of the leathers from this picture. Many thanks to Mr Robert Kelly. 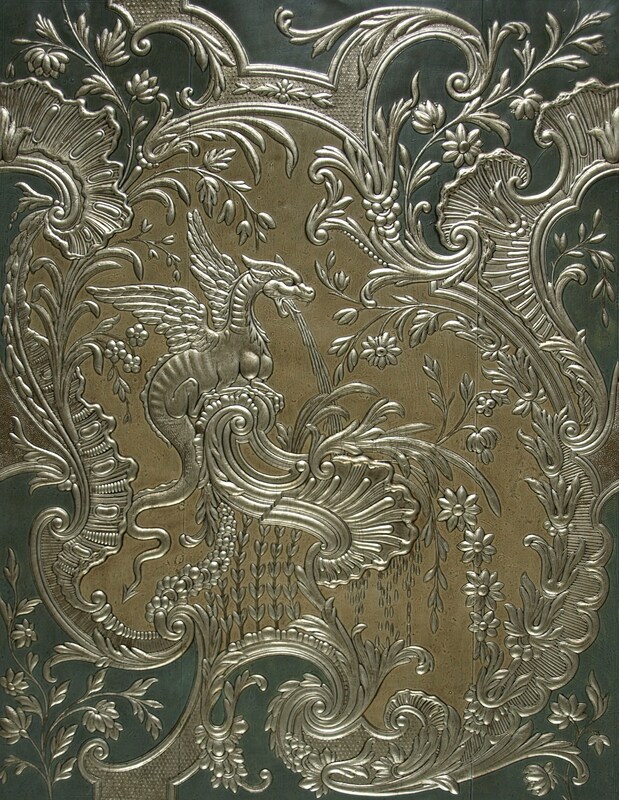 two Gilded Leather panels for an exceptional piece of furniture. It turns out to be a side chair. 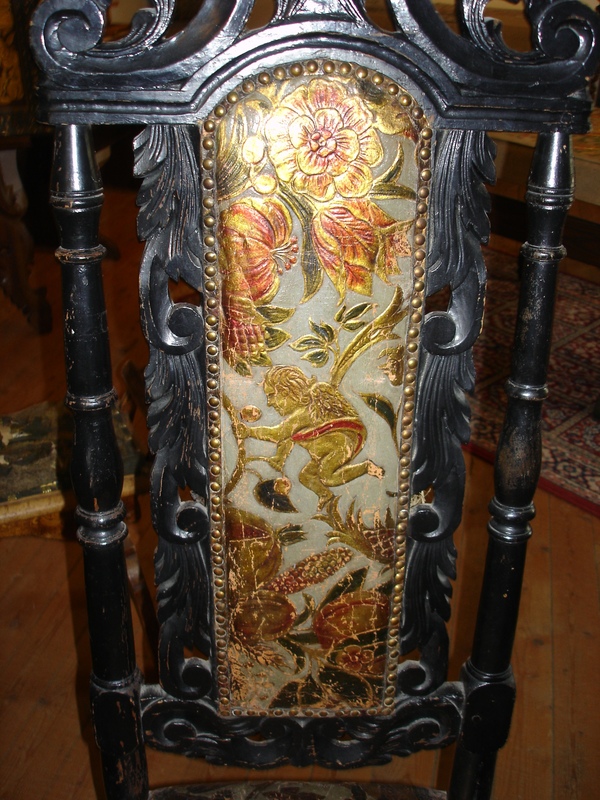 The side chair was part of a huge project for William H. Vanderbilt. As often the case, when the spotlight shines upon a forgotten name or an exceptional talent that went out of the picture, not only does it create stupefaction, it also reveals hidden treasures. Also a single side chair turned up and we were to supply the same leather as for the Metropolitan chair. Eventually in 2008 this same chair came on auction at Sotheby’s. Setting a new record for a Herter Brothers chair. for those of you who don’t want to click the link please find here a copy of the text. A traveling exhibition entitled “Herter Brothers: Furniture for the Gilded Age” was organized and held in 1995 by the Metropolitan Museum of Art in New York and the Museum of Fine Arts in Houston. In that groundbreaking show on Gustave Herter and his brother, Christian — New York’s leading cabinetmakers and interior decorators in the late 19th-century — was a single Herter Brothers dining room side chair. Originally made for the palatial William H. Vanderbilt residence on Fifth Avenue, it was one of the two known examples from a set of at least 18. 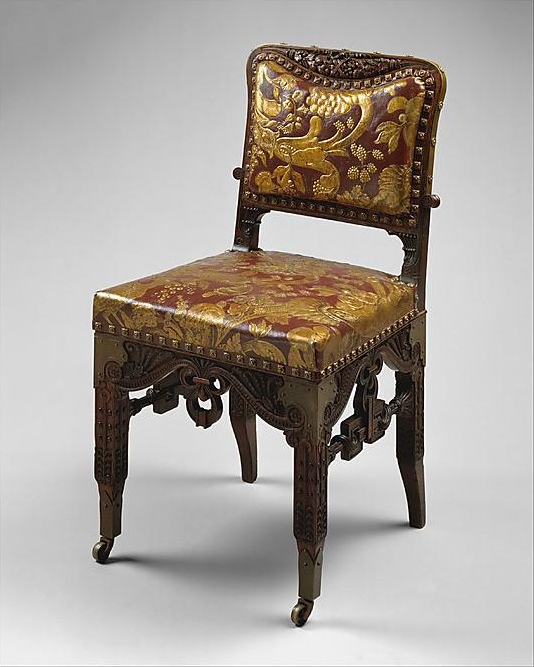 The chair is currently on permanent exhibition in the American Wing of the Metropolitan Museum in New York. Since then, four more side chairs from the suite unexpectedly turned up in the mid-west, and sold at Sotheby’s New York for $99,000 on June 24 in a 19th-century furniture and decorations auction. In 1848 the young cabinetmaker and woodcarver, Gustave Herter (1830-1892), left his native Germany and emigrated to New York City. By 1858, he owned what would become a leading New York cabinetmaking and interior decorating company. Together with his younger brother, Christian (1839-1883), who arrived in New York in 1859, they formed Herter Brothers, which became one of the most respected firms not only in the city but in the whole country. Herter Brothers created cosmopolitan environments encompassiong every aspect of interior design, including furniture and woodwork, wall and ceiling decoration, floor treatments and drapery. 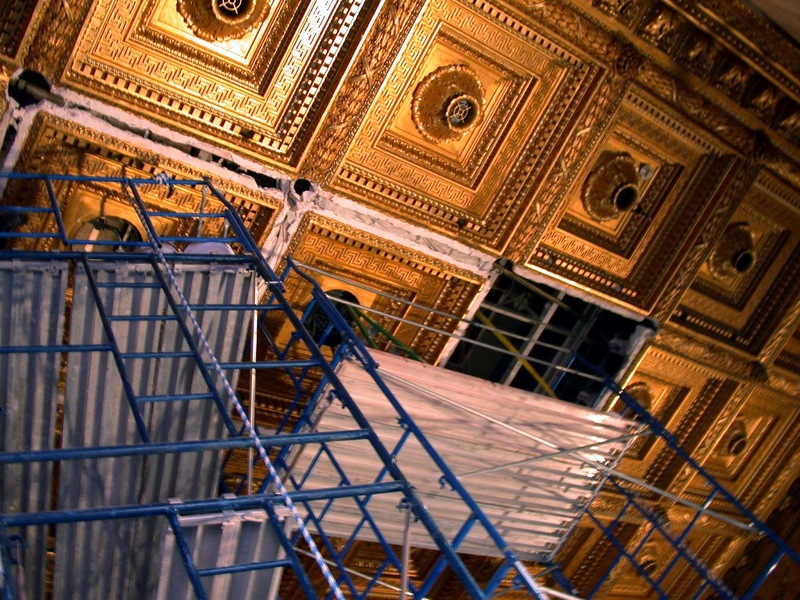 The firm’s clients were among the most visible and affluent of the era — the White House, Mrs. Mark Hopkins, Jay Gould, J. Pierpont Morgan and William Henry Vanderbilt, who during 1880-1882 was building his mansion at 640 Fifth Avenue. A writer in the Decorator and Furnisher in 1887 claimed that “every private residence ever before constructed in America is entirely eclipsed by the house of the American railway king, Mr. William H. Vanderbilt.” It was estimated that 600-700 men worked to complete the huge Beaux-Arts house that occupied the entire block between 51st and 52nd Streets. The total expense was approximately $1.75 million. Interior decorations and furnishings alone were said to have cost about $800,000 — more than had ever been spent on the interior of any other American house. William Henry Vanderbilt (1821-1885) was the son of the financier and railroad promoter Cornelius “Commodore” Vanderbilt (1794-1877). When his father died, William Vanderbilt inherited the bulk of an estate estimated to be worth about $90 million. In less than a decade he had more than doubled that sum. Like many Herter clients, Vanderbilt spent most of his life in business, and was able to enjoy his dream palace for only three years before he died. 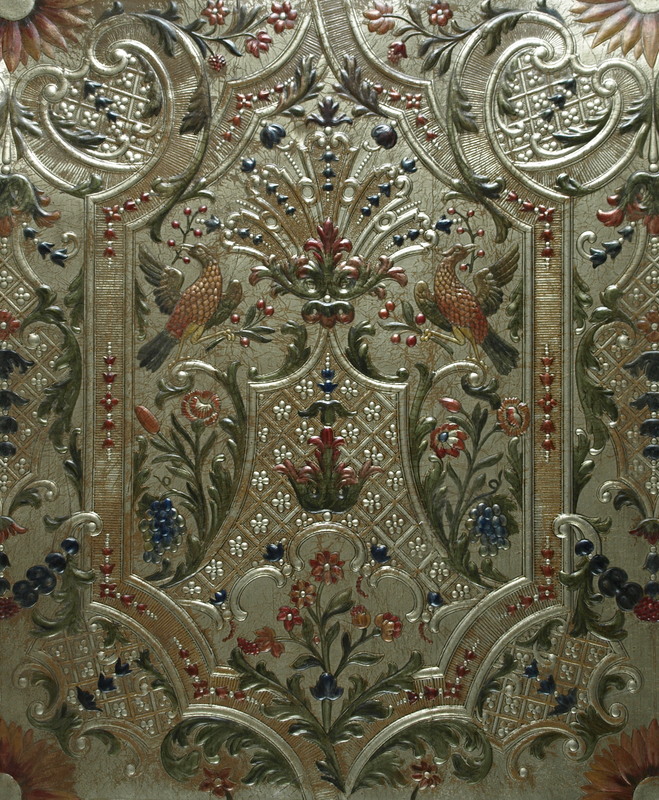 Relatively free from the lingering influence of historical styles and European guild traditions, the Herter factory was able to take certain liberties in its cabinetmaking, carving, gilding and upholstery. 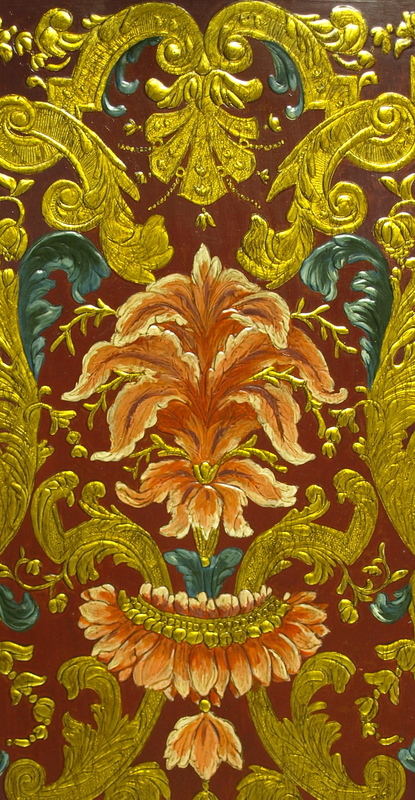 Thus a chair in the Second Empire style, which by French convention might have been made by a menuisier of gilded or painted wood, in the Herter’s hand could become a vibrant combination of imaginatively upholstered, carved, ebonized natural wood decorated with marquetry or ormolu and highlighted with gilding. 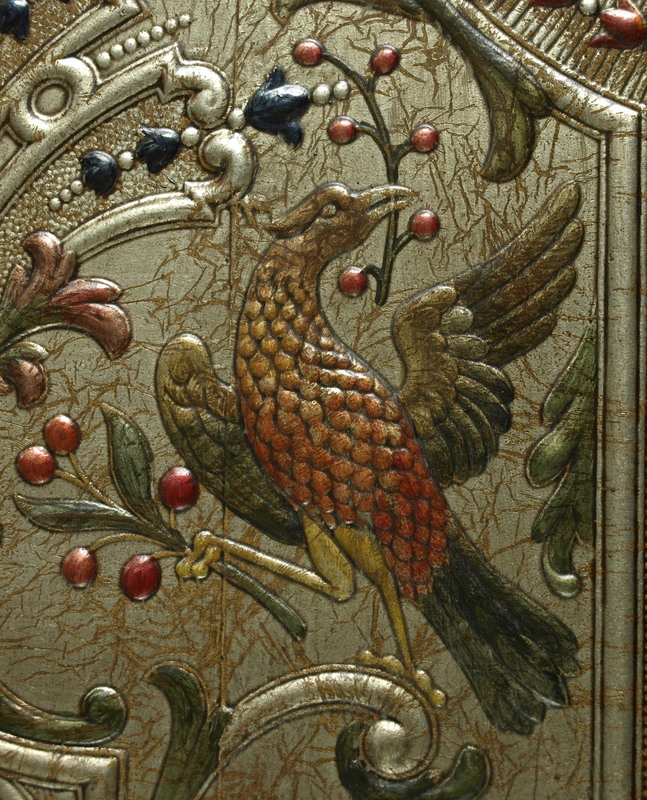 Herter examples have a vivid and adventuresome appearance; they frequently contrast rich rosewood veneers with bright marquetry bands and classical imagery. Part of the firm’s success was due to its exceptional ability to create handcrafted, luxury products in an industrial environment. 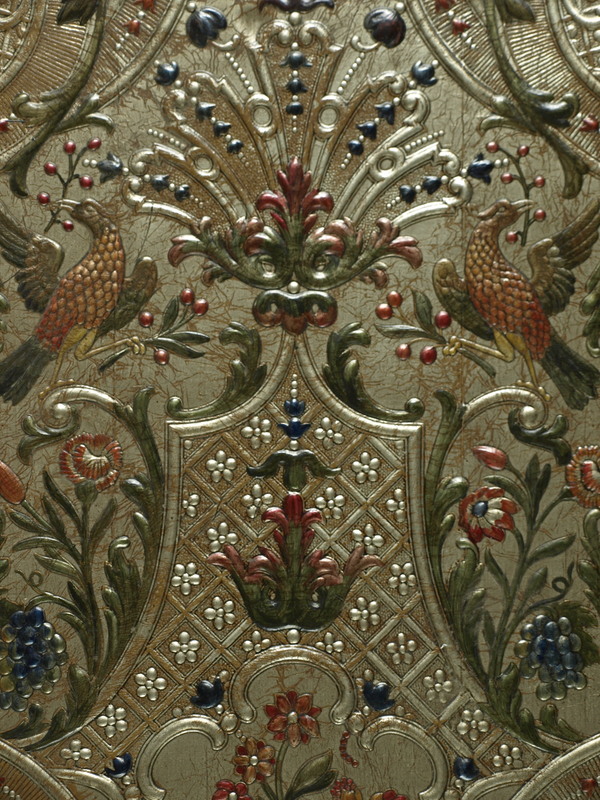 What also distinguishes Herter furniture from its English counterparts of this era is its assertive, complex, floriform marquetry decoration, as opposed to painted and often figurative English surfaces. 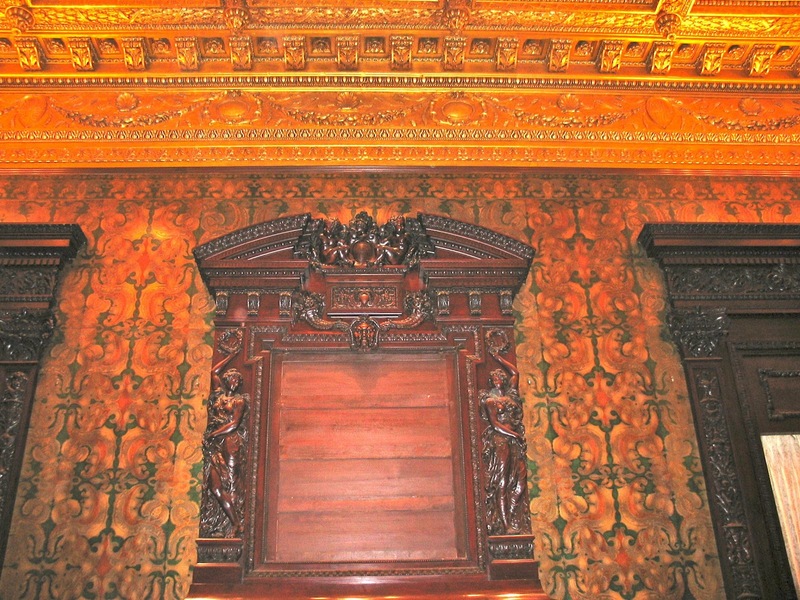 In May 1880 when Herter Brothers received the profitable contract for designing, decorating and outfitting Vanderbilt’s large New York mansion, it was a crowning achievement for the firm, providing the brothers with the opportunity to create the epitome of the cosmopolitan environment with few financial constraints. 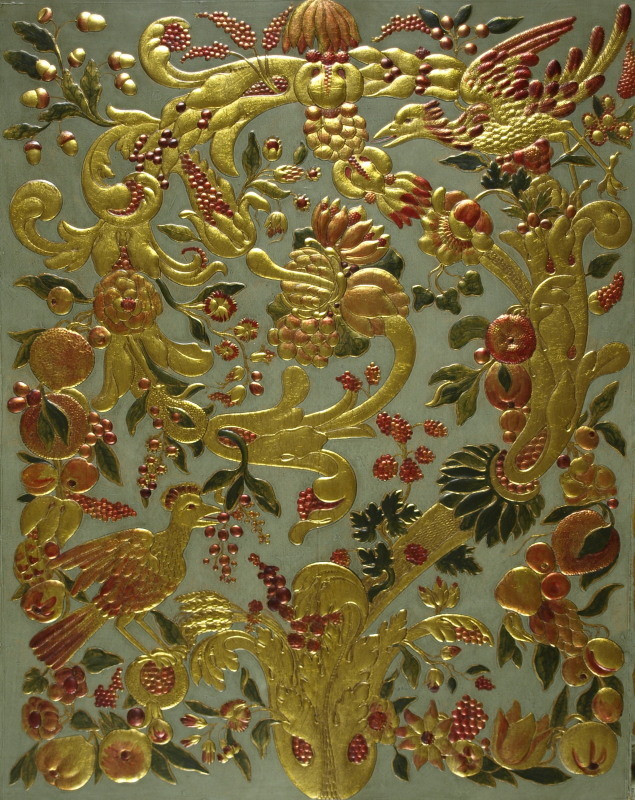 They were superbly matched with their client, who wanted a grand interior to equal his elevated social and economic status, who embraced the firm’s predilection for mixing eclectic styles as an indicator of culture, who relished and could afford the Herter’s lavish use of luxurious materials, and whose public stature would ensure lasting fame for Herter Brothers’ designs. Indeed, the Vanderbilt house garnered considerable notice during its day, most of it focusing on its immense size and cost. The house also achieved lasting posterity from its being published in two lavish limited-edition, multi-volume publications, both appearing in the 1880’s. This remarkable house was demolished in 1946. 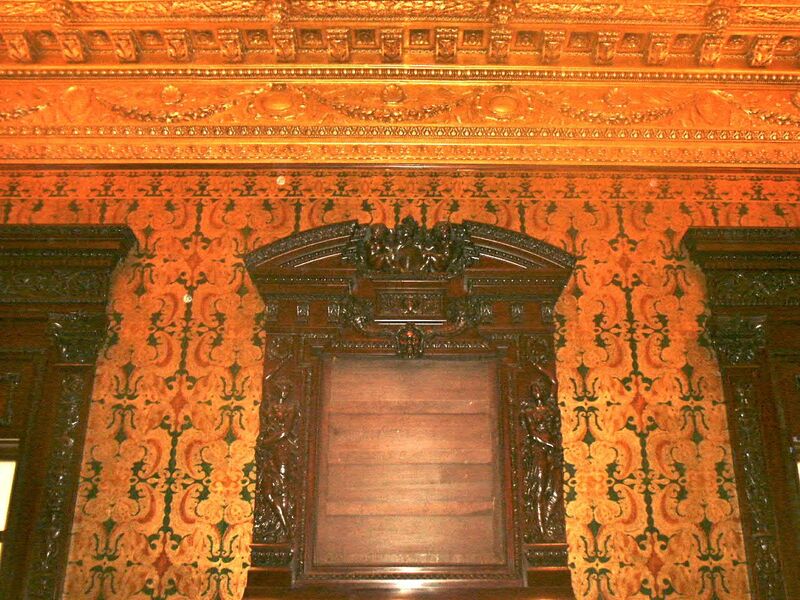 The dining room was of oak carved in the Neo-Renaissance style, as was typical of dining rooms in the 19th century, and appeared solid, somber and rather dark. 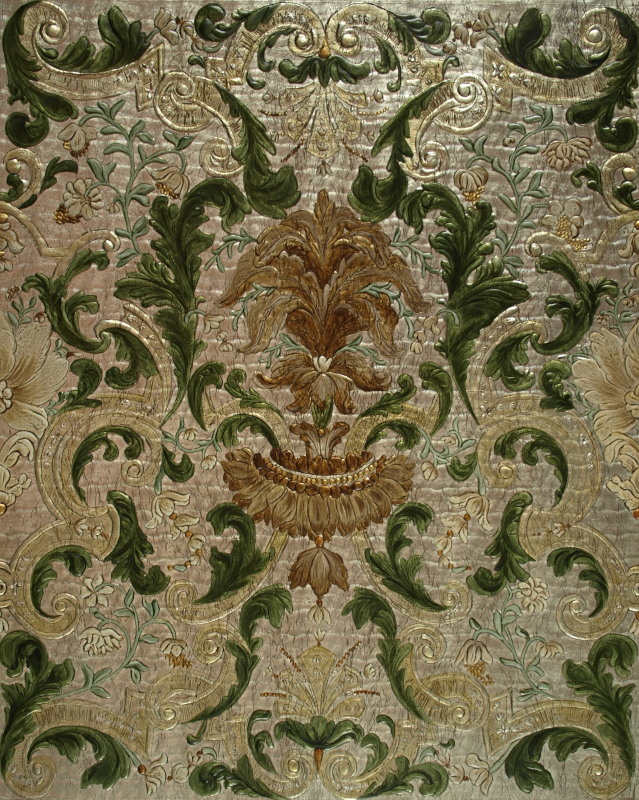 Motifs such as swags of fruit, putti in full relief and low-relief classical vases from which emanate symmetrical floral tendrils were found on the furniture as well as on the built-in buffet and cupboards, which housed some of Vanderbilt’s collection of 18th-century continental porcelain. The dining room chairs were carved of oak to be en suite with the surrounding woodwork. 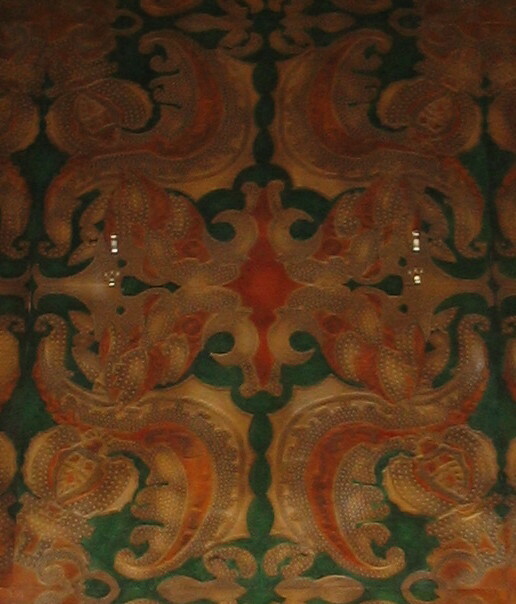 The carved crest rails depict fruit, nuts and flowers, which allude to the function of the room. The chairs’ solidity is belied by the delicacy of the carving. Symmetrical, stylized foliage climbs the square-sectioned legs. The side stretchers are a conceit of the carver’s art: they appear as separate elements — a loop, a chain link and two square rings hang from the center of the side seat rail and join each leg by means of a sash carved to look as if it is looped through each square ring. The stretchers seem to be attached to the legs by means of Egyptian palmettes at either end. 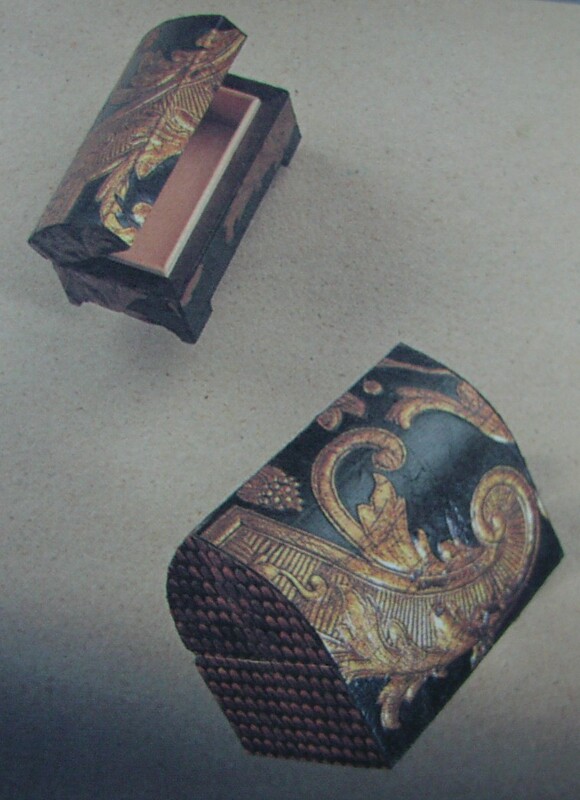 Corners of brass cut into ornamental profiles highlighted with incising to conform to the shape of the carved ornament cover the top of the legs just below the seat rail. Brass also covers the “sock” portion of each leg, and a narrow strip is affixed by means of floral-headed screws to the edge of the chair back. Furniture historians have tended to disparage the quality of American design during the years following the Civil War, and not without some reason. But Herter Brothers’ rational approach, its uncompromising quality and impeccable craftsmanship, and its ability to identify the best in many cultures and embrace it as its own, have set the firm apart from the majority of other furniture factories. The decades following the Civil War, at once brilliant and depressing, dramatize the contradictions within American culture. During the rich confusion of this era, we became industrialized and developed a new life in an Eden that had embarrassingly outgrown its old patterns and institutions. We produced the most amazing gallery of powerful and picturesque personalities we have ever fostered — some ethically corrupt, economically ruthless and politically incompetent, others dreamers and reformers who carried utopias in their heads and men who had money to spend without knowing very well how to spend it. WENDELL GARRETT is senior vice president of American decorative arts at Sotheby’s.